I have found the perfect homemade pizza dough recipe. The family loves it as much as our favorite local pizza place. It is a simple recipe from the instruction booklet from a friend’s bread maker. Pizza also makes a great leftover makeover when you have extra marina sauce. Pizza is always a family favorite as it can be customized pretty easily to fit each group’s taste preferences. Homemade pizza is also a freezer friendly recipe – assemble your pizza onto a baking pan and freeze before cooking. Then cook directly from frozen state. I’ve been doubling the batch and making two pizzas – one for dinner and one for the freezer, which is a quick way to fill our freezer with homemade meals. 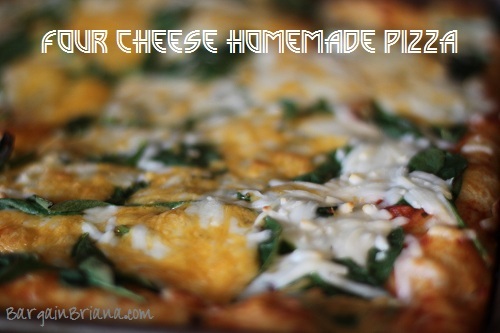 It will be hard to go back to anything but the homemade pizza dough (recipe here) but you could use your normal pizza dough if you don’t have time to make your own. Combine Parmesan cheese, parsley, garlic powder, basil, oregano, thyme, and pepper in a bowl. Set aside. Spread sauce evenly on dough. Sprinkle Parmesan cheese mixture and additional cheese over the pizza topping. Cook at 425 degrees for 20-25 minutes or until cheese is bubbly.